These cookie-like tarts are not only beautiful, but tasty as well. Top sand tarts with several fresh berries -strawberries, raspberries, or blueberries - or fresh currants for the best results. In a 1- to 1 1/2-quart pan over medium heat, cook butter until particles on pan bottom and foam that floats on melted butter turn amber-colored and smell toasted (mixture may bubble up), 5 to 6 minutes. Let cool at least 10 minutes. In a food processor or blender, whirl almonds and sugar to a fine powder (if using a blender, transfer to a bowl). Scrape browned butter into container with nuts and sugar; add egg white, vanilla, almond extract, and flour. Whirl or stir with a fork until blended (dough will be sticky). For petite tarts, use 2 1/2-inch round tart pans (about 3/4 in. deep; 2-tablespoon capacity), lining each with about 1 1/2 tablespoons dough. For cookie-size tarts, use 3-inch round tart pans (about 1 1/4 in. deep; 5-tablespoon capacity), lining each with about 3 tablespoons dough. With your fingertips, press dough evenly over bottom and up sides of pans (nonstick or regular), flush with rims. Set slightly apart in a shallow, rimmed pan (10 by 15 in.). Bake in a 300° regular or convection oven until tarts are richly browned at the edges and slightly paler in the center, 25 to 35 minutes; small tarts brown faster, so start checking them early. 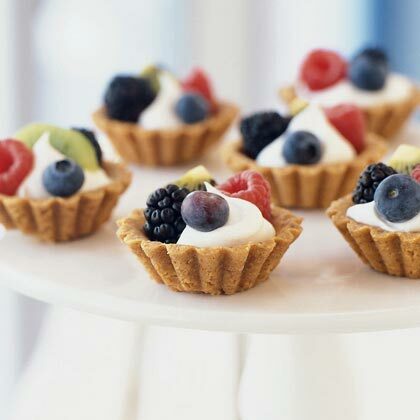 (If you prefer slightly softer tarts, bake only until edges are golden brown, 20 to 30 minutes.) The tarts puff up in the center as they cook, leaving only a small depression. Transfer pans to a rack and let stand until tarts are warm but comfortable to touch, 5 to 8 minutes. Then invert one pan at a time onto a flat surface and gently squeeze, tapping very gently. If tart doesn't fall out, ease free with the tip of a sharp knife. Serve warm or cool. Nutrition alanalysis per 2 1/2-inch tart.